Vogue Pink & Black Duets Bags 25 Pk 16x6x12-1/2"
Vogue size Duets Pink & Black bags sold by the 25-Pack. Made in the USA. 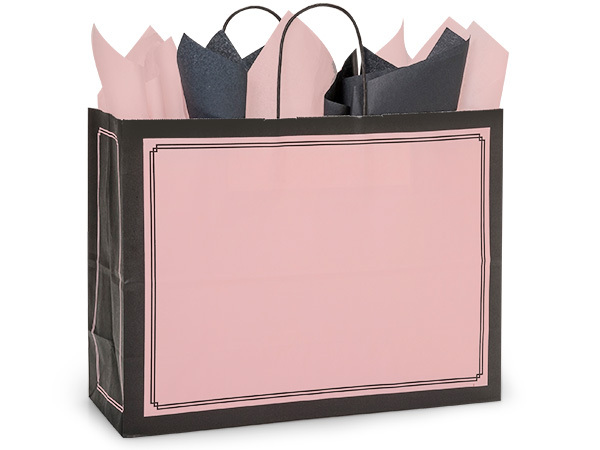 Our Duet paper shopping bags were designed with you in mind! Traditional or fun color combinations are perfect for retail use! The pinstripe border accents a custom printed logo or label. These wholesale gift bags are available in sizes ranging from small to large, and will work for any occasion! We offer metallic gold on a gloss white which is perfect for weddings, anniversaries or graduations! The black and brown kraft combination is both trendy and traditional. Pistachio & Brown and Aqua Blue & Brown are perfect for masculine items, gourmet food or housewares, while the Pink & Black bags are great for Mother's Day or feminine Birthday gifts! We have several printed tissue paper designs to match these bags!